A fair piece of Sunday afternoon “there’s not really anything else on” fare. Inspired by Matt Bondurant’s 2008 biographical novel The Wettest County In the World, musician and composer Nick Cave wrote the screenplay for Lawless. With John Hillcoat directing and a cast including Tom Hardy, Gary Oldman, Guy Pearce andShia LaBouf, Lawless seemed poised to be the “moonshiner’s Goodfellas” and clearly went out of its way in an attempt to do so. They even got Willie Nelson to be on the soundtrack! Unfortunately, what was promised and what was delivered are two totally different things and Lawless turned out to be long stretches of pretty scenery punctuated by vivid and horrific violence coupled with a few great performances and a by-the-numbers plot. Not quite the epic masterpiece for the ages it seemed poised to become. The story focuses on the Bondurant brothers’ successful moonshining operation, run out of their gas station in Franklin County, Virginia. Everybody from the police to the locals are getting drunk on the Bondurant’s brand of white lightning, and everybody is happy until one day a fancy Special Deputy arrives in the form of Charley Rakes. Rakes wants in on the action and won’t stop until he gets what he wants. Naturally, older brother Forrest disagrees. One thing leads to another, violence ensues, and pretty much every moonshinin’, gun-runnin’, “I was a teenage gangster” cliché plays out. Now, the word “cliché” is a strong one which conjures up images of something terrible, and admittedly, it feels a bit too strong to use in this instance; but the word is defined as “an expression, idea, or element of an artistic work that has been overused to the point of losing its original meaning, especially when at some earlier time, it was considered meaningful or novel.” Okay, that’s fair. And it’s also unfortunate, as Lawless is based on a true story. These things really did happen once, oh so long ago. Sadly, this particular version of the tale arrives a bit too late and lacks the heart and soul to be seen as anything other than hackneyed. On the positive side, the film is quite beautiful to look at. The Virginia scenery is vivid in widescreen 2.35:1 ratio and every shotgun blast or crack of knuckles on bone is heard in stunning Dolby Digital 5.1 sound. Compounding this beauty are performances by Tom Hardy and the award-worthy Guy Pearce. I don’t even need to mention Gary Oldman because let’s face it - you know damn well Gary Oldman is awesome in everything he does. And even the ever-annoying Shia LaBeouf shines as the younger brother starstruck by big-time mobsters. So what is it? Is it the unfortunate “too little too late” set of circumstances which rendered this story outdated and obsolete before filming began? I don’t think so; as a died-in-the-wool comic book junkie, I’ve more than a passing familiarity with a retread story living up to and occasionally surpassing the original. There’s more than one way to skin a narrative cat. Is it the dull attempts at proving the film has the legs to stand with the arthouse crowd? The long, slow stretches of quiet talking and navel gazing that seek to give viewers something meatier to sink their teeth into rather than just a bunch of bullets and blood? We’re getting warmer, but those long, slow, and boring scenes still feature some fine performances. Is it simply that the film is overly ambitious, trying too hard to be something it’s not? I’m of the mind that all of this and more - that intangible essence known as “heart and soul”, something the film is clearly lacking - that adds up to make the whole of Lawless much less than the sum of its parts. Or maybe it’s just a crappy movie and I’m putting way too much thought into it? 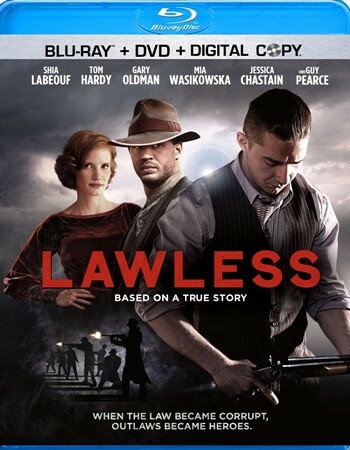 At any rate, Lawless simply doesn’t live up to its name. It stands on its own as a fair piece of Sunday afternoon “there’s not really anything else on” fare and to even call it a bad movie seems a bit harsh. If you like gangster movies, you will probably enjoy like (but not love) it. But rather than give us anything new, fresh, or original, Lawless colors squarely within the lines of its genre, offering us a bit more of the same-old-same-old. The Blu-ray features commentary with director John Hillcoat and author Matt Bondurant, some deleted scenes and a few documentaries on the Bondurant family’s exploits and the county in which it all happened. Oh, and there’s a Willie Nelson music video, something I can’t possibly complain about.